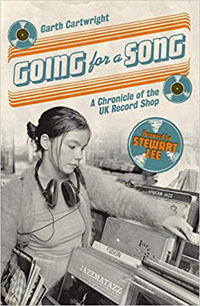 Share the post "Book review: GARTH CARTWRIGHT – Going For A Song (A Chronicle Of The UK Record Shop)"
As we approach another Record Store Day, it is timely to revisit one of the more recent tomes extolling the virtues or otherwise of the record shop. And also to compare and contrast with its antecedent which celebrates a 10th anniversary since first publication in April 2009. Garth Cartwright’s book Going For A Song (Flood Gallery Publishing, March 2018) surveys the phenomenon from earliest times, to the explosion of stores in the 1970s and 80s, the coming of the “mega-store”, and ultimate decline due to a change in consumer tastes. He also emphasises the role of the record shop in the rise of The Beatles who were apparently given free rein by Brian Epstein to raid the racks in his NEMS store in Liverpool looking for rare US R&B which they then fashioned for their own purposes. It’s quite a journey and Cartwright chooses to focus on some of the main independent players but with a soft spot for the local retailer discharging an increasingly diminishing social purpose. The classic record shop was a hub of youth excitement, interaction and, frankly, hope. There are sections on Richard Branston’s Virgin that revolutionised the business in 1971 when it opened its first store in Oxford Street, London. Later that year the second store was opened in Liverpool’s Bold Street in 1971 and this author can identify with the description of “bean-bags”, headphones on posts, brown paper bags (at least initially), and a general heady “fug”. The rise and fall of HMV is also chronicled. He’s good on specialist music stores, reflecting the rise of reggae, soul and dance in the 1970s and 1980s. There are pen portraits of key stores and their owners but readers may bemoan that their local centre for crate digging – or one fondly remembered - is not covered. Cartwright mentions Reddingtons and The Diskery, two mainstays of the Birmingham store scene for several decades. But Cyclops in the city centre goes unnoticed. Your own search online will therefore allow more specific nostalgia. And there is a good website to start your wallowing. Cartwright’s chapter on consumer trends in the millennium – where record buying has taken its place amongst a whole range of activity/distraction for a younger generation – is a useful summary. He recounts a survey conducted by EMI in the 1990s when teenage respondents were offered free CDs after being quizzed about their buying habits. They didn’t take anything. Ironically in the past few years there has been an increase in stores as a result of the “vinyl revival”. But Cartwright is disparaging about Record Store Day as he rightly believes it is now controlled by the big boys (Universal, Sony, Warner) who like to latch on – often belatedly - to anything trendy and money-making. This skews the marketplace but is thankfully only temporary. The book’s bibliography will allow further exploration but the lack of an index is frustrating. Moreover, his complete lack of reference to Graham Jones’ earlier – trailblazing – tome (Last Shop Standing, April 2009, updated 2014) is as unforgiveable as it is unfathomable. Cartwright’s book is very readable but Jones’ initial foray into this world is spiced with many more anecdotes based on his life as a sales rep and is therefore more vibrant and informative. He provided a second ‘volume’ with ‘The Vinyl Revival And The Shops That Made It Happen’ published in September 2018. 2019 Record Store Day is Saturday 13 April. This entry was posted in All Posts, BOOK REVIEWS and tagged book, Garth Cartwright, Going For A Song, Graham Jones, history, Last Shop Standing, record shop, review. Bookmark the permalink.